The Kano computer kit for kids offers much more than merely building your own computer. It’s a gateway for your child – and the whole family – into the mysterious world of coding and a key to unlock the creativity of computing. It was my top pick in my recent gift guide for girls, and I repeat – if your family get only one present for your child, I urge you to make it this one. Ever since having a daughter, I’ve been aware of the stats around girls and STEM subjects – that girls are far less likely to pursue further and higher education in the areas of Science, Technology, Engineering, or Manufacturing (STEM). The reasons are far from clear but everyone has a theory – ranging from girls brains being unsuitable for these subjects, to a range of social and developmental factors driving them away from a very early age. We have always been keenly aware of the need to inspire an interest and connection with STEM subjects and principles in our daughter. We don’t want to push her into a a life in any of these fields – I merely don’t want her to be put off anything simply because she is a girl. This has taken many forms, from passing on my love of ‘geek culture’ (people in tech tend to also like sci-fi and superheroes), encouraging an interest in maths and problem solving (which can be as simple as playing with LEGO and jigsaw puzzles), and trying to highlight female role models where we spot them. For instance, my daughter is keenly interested in Batgirl of Burnside. When I read it to her, I tend to emphasise the fact that Batgirl’s ‘powers’ include a keen scientific mind and incredible computer coding skills. The latest version of Batgirl has a super-powered mind for coding. From ‘Batgirl of Burnside’ by Cameron Fletcher and Babs Tarr. © DC Comics. Batgirl actually needs these special abilities to defeat that most modern of super villains – a computer algorithm. ‘Coding’, aka ‘programming’, is something we know our kids are supposed to be learning. It has been included in the national curriculum for a couple of years, part of a concerted effort to fill a perceived/projected skills gap in the UK tech sector. The aim is that instead of simply teaching our children how to use programs, we need them to learn how to make programs. Software, apps, and algorithms govern our lives, and will likely continue to do so. It’s in everyone’s best interests that we understand how they are written. The implication is clear – if you want to keep your kid’s options open for the future, coding is key. When I was a child, there was the groundbreaking Computer Literacy Project (CLP), which led to the BBC micro computer being a fixture in schools and homes across the country. While the programming language was it’s very own (BBC Basic), the principles were the same – lines of code that created a program, whether a game, application, or something else entirely. I once created a version of Hal 9000 (from the film 2001), my very own attempt at AI. I like to think he became self aware and still out there in the digital white noise somewhere. This 1980’s explosion of kids (and adults) learning how to code has been credited in part with the success and depth of knowledge within the UK tech sector. Only, it didn’t last. The BBC Micro found no place out of UK homes and schools, and the advent of Macs, PCs, and gaming consoles saw home computing move in a different direction. Since then, computers have rarely invited home users peek behind the curtain in the same way. User interfaces have become increasingly sophisticated to make home computing so infantilised that babies can literally do it. Gone is the exploration and creativity that learning to code inspired. Computers have become passive tools. We are more likely to use them to consume rather than create. We rely on software and algorithms to navigate our digital landscape. Our experience with the Kano so far reminded of my wonderful childhood days of learning and exploring via programming. The Kano is attractively packaged. A bright orange slipcase reveals a sturdy board case with all the component parts. The case has a magnetic clasp, so it is designed to store and/or transport the Kano as required. My wife and I were as excited as our daughter was about putting this together. Out of the box, you construct it in almost LEGO fashion – following instructions to slot and snap bits together. This underlines the most appealing aspect of the concept behind Kano, to shed light on the mysteries of the digital devices that are integral to our lives. The enclosed booklet takes you step by easy step through the construction and initial set up of the computer. When assembled, the ‘computer’ bit of Kano is the renowned Rasperry Pi B+ – themselves doing great work in trying to engage children in programming – in a Kano housing, with a speaker, memory card, and wifi dongle. There are also stickers for your child to customise their Kano. When fired up, it looks like something you’d find in classic Doctor Who or Blake’s 7, which is a wonderful change from the slick looking tech we surround ourselves with. You will need a compatible screen with an HDMI input, and we used our wall mounted TV. This works ok, but if you have one that’s lower or desktop that would be best. At a later stage you will be able to connect it wirelessly to a tablet or phone screen. The keyboard with mousepad is also wireless – which is great to help fidgety children remain engaged. I’m assuming it’s not self aware just yet. What follows are various set up aspects, such as username, connecting wifi, software updates and the like. The first really fun bit that my daughter enjoyed was creating her Kano avatar character, with different face, colour, and costume options. This all takes you to the end of the Kano book 1 (make a computer). We’re now ready for book 2 – code powers. Here you will learn about programming languages, binary code, open source, and more. Now, I don’t know if the following statement is true, but it feels like it is – I learned more about contemporary coding from reading a few pages of this Kano booklet than I had since I left school. So while Kano may be intended for kids age 6-12, it’s perfect for anyone that wants to learn more about computers, which frankly should be all of us. This also harks back to the CLP of my youth – it was intended for adults as much as children. The Kano computer comes loaded with programmes such as Snake, Pong, and even Minecraft – but with the ability to manipulate the code in all of them. There is also a music generator and apps. You can go online and download more. While coding is at the heart of activities, the theme remains that coding is a skill to unlock creativity. Kano is a wonderful example of going forward by looking backwards. It embraces the great aims and principles of the CLP, but using tech that deserves as much of a place in your home as a console, laptop, or tablet. Perhaps even more. This is socially conscious technology that is also a great product. There are plenty of so called computers on the market for children, but for the same price as a potentially crappy kiddy tablet you can get yourselves one of these far more useful and versatile devices. The Kano offers a way for relative luddites like my wife and I to engage in coding and bring this open source tech into our family home. We can introduce the principles of coding to our daughter while learning about them ourselves. As our knowledge increases, we are better placed to support her in her learning journey whether at school or home. Despite my early amateur experience with programming, I never pursed it into adulthood. I studied Information Technology at school, and signed up for a Computer Science A level. But I ditched it after a term – because the class had a crappy teacher and no girls. I hope for my daughter’s sake that neither of those things will happen now. 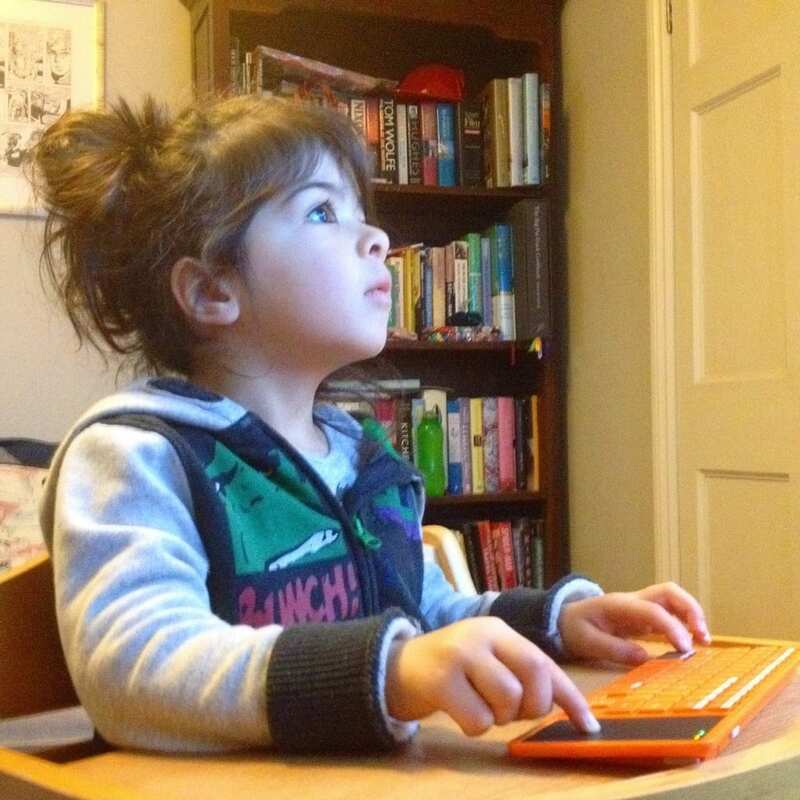 My daughter is 3-years-old, has helped build a computer, and is already engaging in simple coding tasks. She calls her Kano ‘Orange Progress’. That’s as good a nickname as any for this marvellous machine. The Kano computer has a RRP of £119.99 ($149.99 USD) – but you can get it for a special holiday price of £89.99 ($99.99) until 31 December 2015. It’s available from the Kano website. Custom case, stencils and stickers! Disclosure: We received the Kano computer free of charge for the purposes of this review. This is absolutely brilliant! I love the idea of giving kids a practical way to learn about coding and linking it to creativity rather than a dreary sequence on the screen. I would love to see my kids grow up and consume complex coding languages like a sponge! I’ve often wondered if I will one day feel the same bafflement about technology as people from parents generation often do now and I think that if kids as young as 6 are learning to do things most people don’t do until their teens at least, then that day may just come! That’s a good point about getting older and tech. It’s what I feel about snapchat! I have flatly refused to use Snapchat and I’m only 25! Very detailed commentary and everything you say about STEM subjects is spot on. Additionally, the Kano computer is simply brilliant isn’t it? My daughter loves it and I am over the moon that it has introduced her to the concept of coding.